Alzheimer’s is often ranked as the most feared disease, even though many other diseases kill much more quickly. 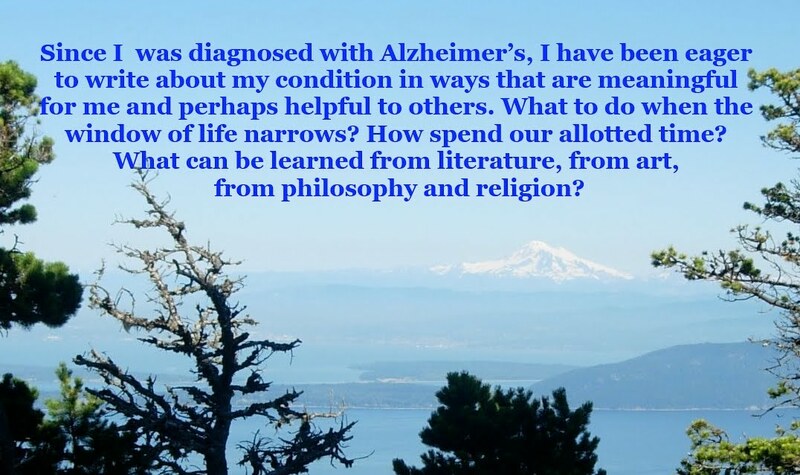 But recently I’ve been wondering whether it is worse to be the person who takes care of the person who has the disease, particularly in Alzheimer’s later stages. First, a word about “caregiver,” the formal term the Alzheimer’s Association uses to denote a spouse or other significant other. At this time, I prefer to describe Paula as my administrative assistant—the title she had in the Northeastern University political science department when we met in 1989. Early on, her unflappable manner became evident. One night I woke up around dawn with an allergy-related panic attack, briefly mistaking it for a heart attack. Big difference, of course. Paula calmly explained why my symptoms were not those of a heart attack. Then she went back to sleep. Since my diagnosis, Paula’s perseverance and masterful organizational skills have been essential. I like to think that, for the most part, state and federal government does a reasonably good job of providing services. But I would be lost in a bureaucratic wilderness if I tried to navigate the Social Security system or Massachusetts’ innovative but flawed Health Connector. It is not hyperbole to say that Paula has been on the phone for an hour at a time searching for the answer for a relatively simple question. The really hard work, for Paula, is likely still many years down the road. Barring something more abrupt killing me, such as getting run over on my bicycle, there is a good chance that I will eventually move into a realm in which I will need professional care, first at home, but maybe eventually in an institution. And this is the great unfairness of the disease. For middle-class families like ours, the cost of professional care could be staggering, based on how long I live. And, because I am otherwise in excellent health, it seems plausible that I could live for another decade, with my cognitive faculties slowly deteriorating. As I wrote earlier this year (“End Game,” March 4), I’ve learned that some people with later-stage Alzheimer’s still enjoy simple pleasures, such as reviewing pictures of relatives, particularly ones who have passed away. This activity is called “scrapbooking,” and it appears to have genuine therapeutic value. I could imagine myself being content, at least for short periods, waxing nostalgic about various periods of my life—my years as a high school athlete, my vocational training on my college newspaper, my youthful decision to abandon journalism to focus on writing fiction, and my deep frustration in failing to find a publisher for my first novel. And I can imagine boring Paula with my repetitive stories—repetitive because my mind will struggle to remember what I just said. Maybe I’ll say something insightful, but then quickly forget what it was. Talking in a sustained and coherent fashion will become a struggle. And, ultimately, the lights will go out, my cognitive reserve depleted, and I will sink into darkness. And Paula will likely feel relief (I certainly would), knowing that the long ordeal is over. But the drain on Paula’s resources could be immense. If you have never heard of B. Smith, here is a brief sketch: She grew up in Scottdale, Pennsylvania, in coal country, about 45 miles south of Pittsburgh. Her father was a steelworker and her mother worked as a maid. Out of these humble origins, she became the first African-American model to appear on the cover of Mademoiselle. In the following decade, the eighties, she opened the first of her acclaimed B. Smith restaurants, in Manhattan. In the early 2000s, her keen taste in home décor led to her being described as “the black Martha Stewart,” through her television program, B. Smith With Style. B. goes on to describe how Dan often gets frustrated with her, and she with him. Particularly disturbing to Dan is that B., despite her previously exquisite sense of taste, has begun to hoard things. A recurring motif is Dan’s frustration with the sheer weight of B.’s purse, jammed with many objects for which she has no use. B. concludes this monologue by expressing her desire to visit her parents in Pennsylvania. Then she remembers that her parents are dead. She does not know what year it is. An ominous warning came in early 2013, when Dan and B. were the co-hosts of a SiriusXM talk-radio program. B. was in her early sixties. As Dan noted, silence on the radio is deadly. When B. asked a question, the guest replied, but B. failed to return the volley. She seemed to blank out for a moment. This book, however, is far more than an account of someone enduring an incurable disease. Each chapter is followed by a useful “Lessons Learned” section. One lesson soon became obvious: B. was in no shape to drive. Previously, she had made absent-minded mistakes, such as failing to replace the removable roof on one of their vehicles. It rained that night, and the interior got soaked. More significant, for sentimental reasons, was B.’s leaving Dan’s wallet on top of one of their cars. The wallet contained a medal that a friend entrusted to Dan; the friend had had his hand blown off in Afghanistan. Despite an exhaustive search on a short stretch of road near their summer home on Long Island, the medal was never found. In a very dangerous episode, B., angered by something Dan had said or done, commandeered the couple’s Mercedes G-Wagon. Dan was astonished. He saw B. fly past at high speed. Police were summoned, and it made the nightly news. B. ended up abandoning the vehicle and walking an astonishing number of miles—in pumps—from where she’d abandoned the car in lower Manhattan. 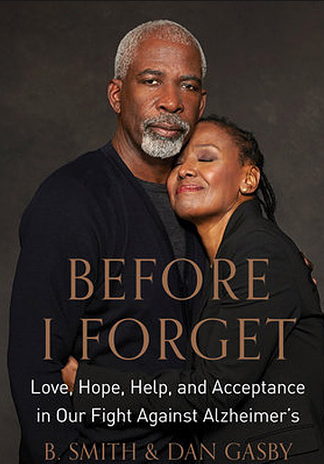 This book—which also includes an authoritative section on Alzheimer’s research—is especially good in describing the frustrations of the disease, for caregivers and people living with Alzheimer’s alike. My cohorts in our early-stage Alzheimer’s support group tend to have subtle symptoms, such as losing one’s train of thought (a problem of mine) or having trouble dredging up specific words. Sadly, B. inhabits a much more circumscribed realm. The heartbreak for B., Dan, and Dan’s adult daughter is that the disease appears to be moving quite swiftly. The deterioration of her faculties must be heartbreaking for her loved ones. Research indicates that African Americans and Hispanics are more susceptible to the disease than the population at large, and Before I Forget devotes an entire chapter to Alzheimer’s and African-Americans. I admire Charles Ogletree, the renowned African-American Harvard law professor who recently announced that he has the disease. And I am confident that Professor Ogletree will bring a powerful voice to the discussion about Alzheimer’s. There remains much work to do to demystify this often-misunderstood condition. When I was diagnosed with Alzheimer’s in June of last year, I assumed there was nothing I could do to slow its advance. What I knew about the disease was not much more than what I’d learned from the 1981 movie On Golden Pond, which I viewed when I was in college: the Henry Fonda character getting lost in his own woods. There was no cure. And, as I soon learned, the handful of drugs to treat the disease are of limited help. What I did learn was that certain choices—daily vigorous exercise, a good diet, good sleep hygiene, and social and intellectual engagement high among them—could alter the equation of living with the disease. But it was just last week that I grasped how consequential those choices can be. I came across Rudolph Tanzi when I was trying to land a panelist—John Zeisel, the author of I’m Still Here: A New Philosophy of Alzheimer’s—for a forum I was organizing this past spring. A Google search turned up Tanzi’s appearance on Zeisel’s “Hopeful Aging” local-cable program. This was Tanzi’s central point: “Ninety-five percent of the time you are in control of your genes.” This came as a revelation. I’d assumed the opposite. It’s true that people who inherit the APOE4 gene are at higher risk of developing Alzheimer’s. But even those of us who have the disease can, to a significant extent, control our fates. This might sounds like magical thinking, but the research is embodied in the field of “epigenetics”—the study of how organisms drive changes in gene expression without altering the genetic code itself. The term dates back to the 1940s. And if you have the misfortune of having Alzheimer’s, there is much compensating you can do, through exercise, modifications to diet, good sleep hygiene, intellectual and social stimulation. An overarching purpose in one’s life seems to be theraputic as well. And in contrast to the outdated assumption that brain cells are finite, Tanzi emphasizes that there are many ways to generate new brain cells. “Exercise induces them,” he said.…It clears up the area where they are going to be born.” Daily meditation is recommended. Stress, on the other hand, is to be avoided as much as possible. For me, the worst period was 2013, a year in which I made two significant mistakes overseeing publications, one of them quite costly. Had I been screened for Alzheimer’s at that time, I could have spared myself a lot of grief and embarrassment—and, more significantly, corrosive anxiety. Tanzi elaborated on some of these points in his foreword to the book Before I Forget: Love, Hope, Help, and Acceptance in Our Fight Against Alzheimer’s, a colloboration among B. Smith, the celebrity restaurateur and lifestyle maven who disclosed she had early-onset Alzheimer’s in June 2014; her husband and manager Dan Gasby; and the professional writer Michael Shnayerson. Gasby and Shnayerson describe Tanzi as among the three most prominent figures in Alzheimer’s research. In the mid-eighties, according to the two writers, Tanzi was among researchers who discovered the first Alzheimer’s-related gene, APP, amyloid precursor protein. After I was diagnosed, I anticipated a long day’s journey into night. But after becoming acquainted with Tanzi’s work, I don’t envision such a sharp linear descent. I’m not suggesting that this is the equivalent of a cure. But it makes me feel that in some modest yet significant way, I’m behind the driver’s wheel, not just trundling toward my execution. With the exception of mussels, which make me violently ill, I can eat pretty much whatever I want and not gain weight. This, I concede, is a nice problem to have. But there have been times—especially in the months leading up to my being diagnosed with Alzheimer’s—during which I’ve been disconcertingly thin. Thanks to a trip to Berlin and Prague last September, I embraced the Central European Diet, consisting primarily of sausages and sauerkraut washed down by the best Pilsners on earth. I gained back five pounds, getting me back to 140 pounds, more or less my typical weight in middle age. Once I regained those pounds, I started choosing carefully what I would be eating. I’m no vegetarian. Paula and I eat fish or chicken at least once a week. But I have pretty much abandoned red meat. My standard breakfast consists of a double-serving of five-minute oatmeal. About once a week I soak a half-cup of steel-cut oatmeal overnight, and then simmer it for ten minutes in the morning. I add a half-cup of plain yogurt for the protein and calcium, along with a mashed-up half-banana and raisins or dried cranberries, and the contents of a single walnut. Walnuts also feature in my typical lunch: I read somewhere that five walnuts a day may help forestall Alzheimer’s. These kind of claims are best consumed with a healthy sprinkling of skepticism, but, if you like walnuts, there’s really no downside. Now that it’s summer, I’ve been eating a lot of steamed spinach, and earlier this week Paula prepared a terrific kale salad. I’ve also resumed eating broccoli, either raw, steamed, or boiled. I also consume a lot of chickpeas, either in the form of hummus or in a simple chickpea salad. Organic carrots have been a staple in our kitchen for years, and I almost always eat them raw. I also consume a lot of fruit—huge quantities of Bing cherries from Eastern Washington this time of year. Unfortunately, according to Jay Ingram, author of The End of Memory: A Natural History of Aging and Alzheimer’s, Bing cherries and other fruits seem to lack some quality that most vegetables have: the ability, to some modest extent, to delay the disease’s progress. Over the last week or two, my lunch has often included tins of sardines or herrings, each of which are rich in omega 3 fatty acids, an element said to be good for the brain. Herring has the aesthetic edge in that it is less fishy-tasting and, more important, less fishy-smelling. To further blunt the taste, I serve the herrings or sardines on a bed of wilted spinach, and then top the fish with slender rings of raw onions. I finish off the entrée with a simple dressing of olive oil, balsamic vinegar, and ground pepper. It’s good. Believe me. Paula prefers that I eat it out on our deck, and she has developed a strict protocol for disposing of the can’s smelly residue. The procedure is too complicated to describe here, but it appears likely to win approval from the Food and Drug Administration. Already OK’d are my canned salmon-and-onion sandwiches, served between two slices of multigrain bread. One thing worth underscoring: It would be hard to devote so much time to my diet if I were still employed. Following the slow-food movement requires leisure time, and for the first time in decades, time is a robust commodity of mine. My family and I, plus our daughter’s friend, spent the better part of last week in Chatham, on Cape Cod. We were less than a ten-minute walk to a beach on Nantucket Sound, and we made the walk several times. On one of the days my son and I did a lengthy bike ride. But I will remember this trip more for what I didn’t do. I didn’t join the rest of my family on a trip to Chatham’s commercial district. My intent was to spend an hour or so reading on the cabin’s deck, near the shade of a scrub pine and a scrub oak, the oak garlanded with moss and festooned with lichen. At regular intervals, I would set my book aside and gaze into the oak’s canopy. There was a brisk breeze. When I tilted my head back, the clouds seemed to be rushing by on a conveyor belt. I heard the wind sough. The sun was glaring. It reminded me of a movie from the early nineties, in which River Phoenix played a character who experienced intense narcoleptic dreams. When I went back to my book, I felt something strike me on the crown of my baseball cap. It was a brown cigar-shaped seed from the scrub pine, about an inch long. Was I being taught a lesson? Stay attentive, don’t bury one’s nose in one’s book? A couple of weeks after my diagnosis last June, I was out for a walk when I came across a snail on the sidewalk. The rain had been heavy earlier that morning, and I had chosen to wear my Italian hiking boots that my mom bought for me just before I left for a term abroad in West Germany in 1983. Thirty-two years later the original thick red boot laces remained intact, despite being exposed to hundreds of feet of snow in the years since. I’d been walking vigorously, for exercise, when I saw the snail, and was careful, plodding human that I am, not to crush the life out of this proverbially patient creature. How long would it take that snail to cross a single square of sidewalk? Minutes, hours, days, months, years, decades, centuries? How many eons for evolution t0 produce this exquisite whorl? When did the lowly, unctuous slug first take up residence in a tawny palace?